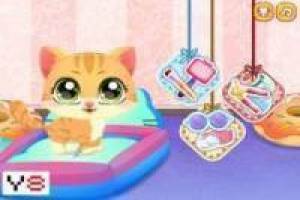 If you love cats, this game will allow you to share a fun time with your favorite pet. Asearlo have the opportunity, putting on a mask, feeding, applying cologne, dress it by choosing different dresses until you find the one you like, if you like'll be putting on hats. In addition, you will have to clean up your bed and sprinkle flavoring for your cute cat can rest in a clean space. Finally, you will share with your pet a section where you will catch diamonds, hearts and coins to earn points in the game. Enjoy the game Attending the cat, it's free, it's one of our cats games we've selected.